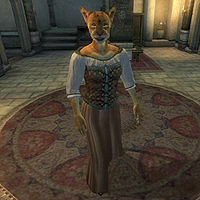 Shamada, a Khajiit commoner, is one of the three sisters working at the Three Sisters' Inn in Leyawiin. She claims to be the hostess there, but Shuravi is the one to talk to if you want a room or a meal. The youngest of them, Shomara, does the cooking. She wears a set of middle class clothing made up of a quilted doublet, tan linens, and a pair of doeskin shoes. She also carries a small amount of gold around with her. While her sister Shuravi refers to her duties as "sweet and decorative", Shamada will have a different perspective. When approached for the first time she will say: "I'm Shamada, hostess of the Three Sister Inn. Speak to Shuravi if you need beds or meals." If you ask her about Leyawiin she will reflect on the many political issues in the county: "It's a pretty town, and everyone is really friendly, except maybe some Khajiit and Argonians who are upset about the Trans-Niben. I think it's a shame how they took that land from Elsweyr, and Argonians are afraid it could happen to them, too." Esta página foi modificada pela última vez à(s) 05h47min de 20 de outubro de 2015.